If you need to have your Exchange email account and Nokia E71 stay in sync, then Mail For Exchange is your solution. This will give you a true push email experience on your E71. It's easy to set up and it's free. Click here to find the official Mail For Exchange support page by Nokia. You will also find the download link there where you can install it on your E71. The newest version is 2.5.3. Now we just need to wait for BB connect to be available for the E71. It's not currently supported yet but it should be coming soon. For a nice review of Mail For Exchange and a comparison to RoadSync check out this article by SMS Text News. Keep in mind that piece was written earlier this year and MFE has been updated since then. Nokia really needs to work out whatever they need to with RIM and get the BlackBerry Connect client running for the E71. If this thing gets BB Connect, I will be buying several. Many of us work for companies that only allow access to corporate email through BlackBerry, and would never give out direct access to the MS Exchange Server for something like Mail For Exchange. Come on Nokia, this is a business phone, give us business class email. I agree buddy. I really can't believe they haven't worked out a deal yet to get BB connect working on the E71. Maybe Blackberry feels threatened by the E71. I have been trying to get my mail for exchange to work , however it seems like after installing it and everytime i try synchronizing it i get a message saying Invalid Mail for Exchange credentials. Check credential settings ??? Help! i want an option to sync my outlook email via usb, as my it admin doesn't allow login via smart phones. i want a solution like active sync in Windows mobile phones. Any help?? i'm using MS outlook 2003 for emails, can i use this Mail for Exchange to sync with my MS Outlook..
Hi, I am trying to support a member of staff at my company who has an E71. He says that he can't put both and Exchange account and a normal pop3 account on his phone at the same time - is this true?! He's in another country so I can't look at the phone in person! Any help would be gratefully received. I am able to connnect to my Exchange account. But no mails are downloaded or being pushed into my phone? Any ideas?? Hi Guys, there is a new version of Mail for Exchange 2.7 out for download. Mail for Exchange might be cool, but no sane system admin would allow anyone into a corporate network without VPN. And that is clearly not the area where the E71 excels. Hi. My e71 sync's fine with exchange. But only from the mail inbox not from my sub folders. And it is the same with contacts. This is a major problem if you have a lot of contacts and mails coming in. I spoke to Nokia support and they blamed exchange. Any ideas? Exchange is not the problem, Nokia are just shifting the blame for their poorly written software, and showing their incompetence by saying that. 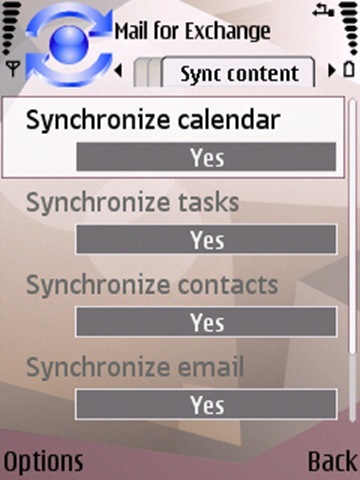 Roadsync (try google for link) is an alternative Exchange app for the E71 which does do sub-folders. my data usage when exchange is connected to always is through the roof. This is not PUSH email if its maintains a constant connection. Its about 5mb per hour of data constantly traveling down the pipe. This is not acceptable in Aus with extrememly high data rates from carriers. Has anyone else experienced this?? The e71 is growing on my as i work out more stuff. However my Bold i use for work is so much better in every aspect. There is an option inside mail for exchange where you can change it so its not always connected, it is by default set during peak time (mon-fri 9-5) to always connected, if you have a small or no data plan then change it once every hour or so. You really need to simplify the way users configure mail for exchange servers. The process you currently have in place is a joke get with it guys. for all those who want to use their office email, please install the root certificate in your phone then it will work. check with your admin on the root certificate and you will be able to run that file on you n71 to get your exchange running..it worked for me.. The E71 doesn't Push??? Are you sure?